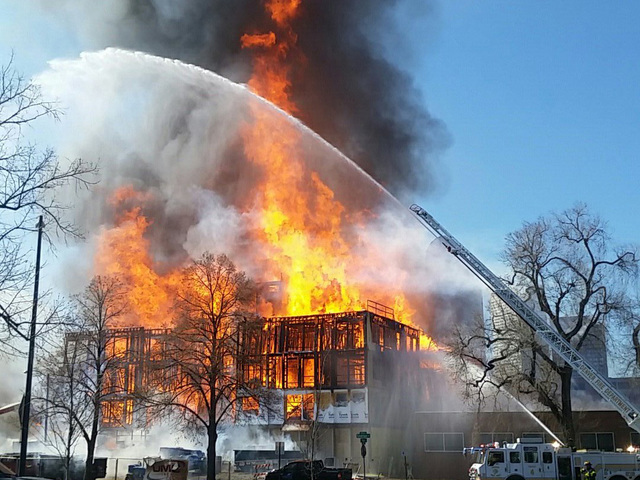 DENVER — Firefighters found the body of a missing construction worker in the smoldering debris of a massive construction fire in Denver's North Capitol Hill neighborhood that injured six people and damaged surrounding buildings and vehicles. One person is still unaccounted for. Hundred-foot flames and smoke could be seen for several miles when Denver firefighters arrived on scene at 1833 Emerson Street around noon Wednesday. The fire is believed to have started on the 3rd story of the five-story construction project. The exact cause is still under investigation. Four people were treated for smoke inhalation. A Denver firefighter was treated for burns. One person was transported to Denver Health with critical injuries. The injuries sustained to the other individuals were described as non-serious. Denver Fire Capt. Greg Pixley said around 50 construction workers were inside the building at the time of the inferno. Firefighters arriving on scene rescued multiple people and witnessed construction workers leaping from the second and third story of the still uncompleted building, causing some of the reported injuries. Witnesses said they saw people running and heard screams just as the fire broke out. Explosions were also reported. “A number of construction workers were leaping and jumping from the second and third floors trying to remove themselves from danger,” Pixley said. Thirty minutes after the first call came in, nearly 100 firefighters were able to extinguish the main body of the fire amid intense flames. Crews later determined that two construction workers were unaccounted for. A search of the smoldering debris revealed the body of one the missing workers as crews continue to sift through the charred remains of the building for the second victim. The fire prompted the evacuation of more than 200 people in the North Capitol Hill neighborhood. 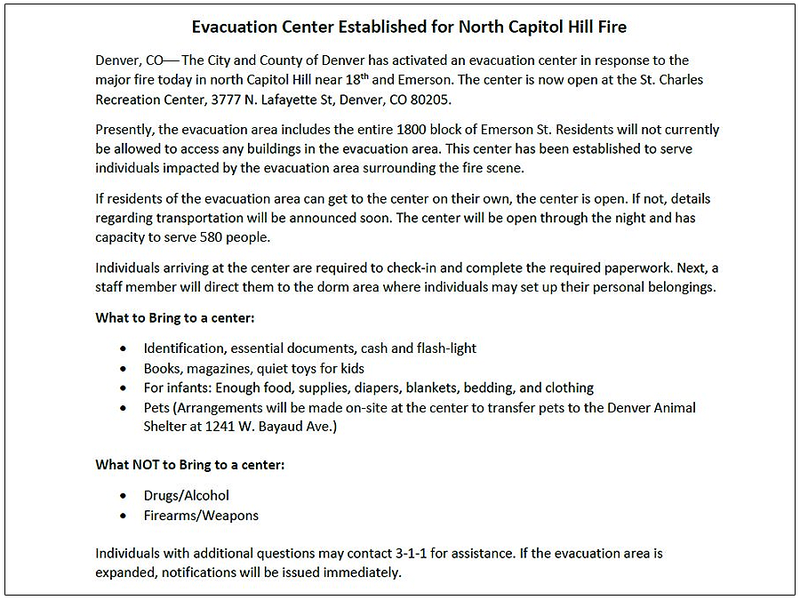 The City and County of Denver activated an evacuation center at the St. Charles Recreation Center, located at 3777 North Lafayette Street. The fire took off quickly and created an intense amount of heat, spreading to nearby buildings. One additional structure was lost while six nearby buildings sustained some type of damage, according to Pixley. Additionally, crews extinguished six rooftop fires that were sparked by wayward embers. Ash was spotted as far away as the 16th Street Mall. 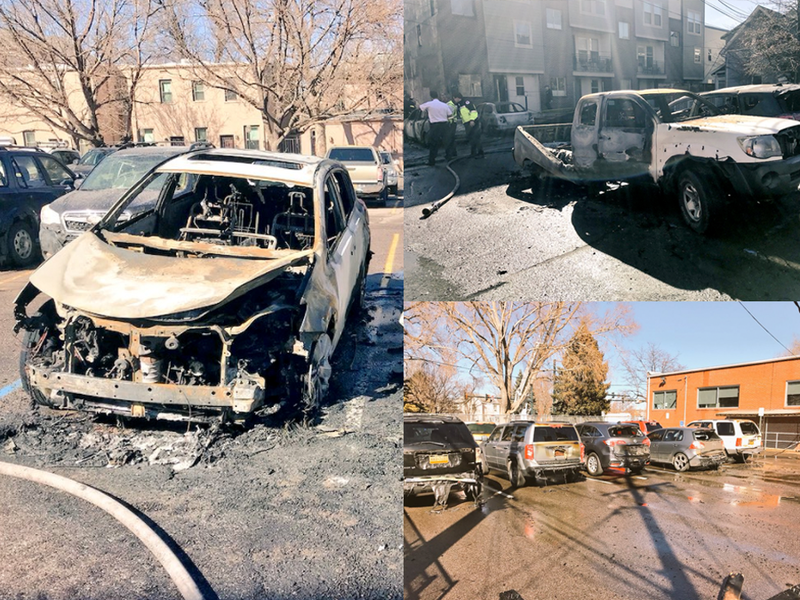 Pixley said 40 vehicles, parked in alleyways and surrounding parking lots, were damaged or destroyed in the fire. The intense heat took its toll on construction and firefighting equipment, too. Three fire engines and several construction vehicles were damaged. The fire could have been a lot worse, Pixley said. Construction crews were trying to douse the flames before firefighters arrived. “If it wasn’t for the efforts of the construction workers and their efforts to look out for their own colleagues within the building, and in addition to trying to do their best to reduce the amount of damage, it could have been a lot worse,” Pixley said. The five-story apartment building under construction, called Emerson Place, was an all-wood frame when it went up in flames. Allante Properties is the development company behind Emerson Place. Darell Schmidt, a spokesperson for the company, told Denver7 he believes his crews got out, but he's unclear if there were any injuries at this time. Schmidt said at the time of the fire the project was framed out and topped off with exposed wood. Construction began approximately 18 months ago. First and foremost, we want to express our sincerest condolences to those affected by this fire, especially those directly affected by the loss of life we now know about. As a family, we are absolutely devastated by this tragedy. At this hour, details are still emerging from fire investigators, and what we know, you know. We remain extremely hopeful for the life and safety of the person who is reported missing at this time. We will assist the investigators in any and all ways, and will have more to say as this continues to unfold. Pixley says he has no reason to believe the builders were not following proper permitting procedures. Crews continued to hose down several hot spots and will be monitoring the smoldering site into the evening.